To Cite: Amirifar A, Rahimi A, Faizi F, Sirati nir M. The Psychometric Properties of Richard Campbell Sleep Questionnaire in Patients in Intensive Care Unit, Crit Care Nurs J. 2018 ; 11(1):e65483. doi: 10.5812/ccn.65483. Background: Patients hospitalized in critical care units are at risk for developing different health problems such as sleep disorders. Detection of sleep disorders is very important and needs the appropriate tools. This study was aimed to determine the psychometric properties of Richard Campbell sleep questionnaire. Methods: This methodological study was conducted in the cardiac surgery intensive care unit (CICU) of Military Hospital of Tehran in 2016. A standard translation of the questionnaire was provided, and face and content validity of the questionnaire were qualitatively evaluated by the main users (patients) and experts, respectively. Reliability of the questionnaire was determined using Inter-rater reliability and internal consistency. In this study, 100 patients who met the inclusion criteria were selected using convenience sampling method. On the 2nd and 3rd day after the hospitalization, quality of their past night’s sleep was measured using the questionnaire. Results: The face and content validity of the questionnaire were qualitatively at desired level. The reliability of the questionnaire through inter-rater correlation coefficient and the Cronbach’s alpha value were 0.714 (P < 0.0001) and 0.906, respectively. Conclusions: According to the results, Richard Campbell sleep questionnaire is a simple validated instrument that can be used by health care providers such as nurses to measure the quality of sleep in patients in cardiac surgery intensive care unit (CICU). Sleep is an indispensable need for the recovery of hospitalized patients (1, 2). Patients admitted to the intensive care unit (ICU), who are usually critically ill patients, need more sleep, however, they are at a higher risk for sleep deprivation, poor sleep quality, and disturbed sleep-wake cycle (3, 4). In previous studies, sleep deprivation has been identified as a major challenge in ICUs (4-6). And more than 60% of ICU patients are reported to suffer from sleep deprivation and sleep disorders during hospitalization (7). Orwelius et al., (2008) made a large-scale study on 1625 patients hospitalized in medical and surgical intensive care units and found that 38% of them had difficulties in falling asleep and 61% were in the need for more sleep (8). Detection of sleep disorders is very important and needs the appropriate tools (9). Due to the importance of sleep disorders, they have been measured long ago, and many questionnaires have been described in the history of sleep disorder assessment. These questionnaires can be used as diagnostic tests or for evaluation of treatment response. Questionnaires are also important instruments in epidemiological studies and clinical trials (10). In earlier studies regarding the sleep of ICU patients, predominantly objective methods have been used and only in some extent various subjective ones (11). The commonest objective method is polysomnography, which is the most reliable and valid method available to measure sleep; it is also against it that other methods are evaluated (11, 12). The disadvantage of polysomnography, as with several other objective methods, is that it requires advanced equipment and is time and cost consuming, due to the fact that it requires expertise to interpret the results. In subjective methodologies, the patients themselves describe the quality and quantity of their own sleep, usually with the aid of a questionnaire. The advantage of these methods is that it takes relatively little time to collect information on patients’ sleep and process the data (11, 12). The Richard Campbell sleep questionnaire (RCSQ) is one of the instruments that, due to its unique features, such as simplicity, having short items, and visual state is used to measure the sleep quality in patients in the intensive care unit (ICU). RCSQ was developed by Richard Campbell in 2000 for the assessment of sleep quality among critically-ill patients in critical care units. Richard Campbell et al., evaluated the reliability of the questionnaire through internal consistency assessment and reported a Cronbach’s alpha value of 0.90, and principal components factor analysis revealed a single factor (Eigenvalue = 3.61, percent variance = 72.2). The RCSQ total score accounted for approximately 33% of the variance in the PSG indicator sleep efficiency index (P < 0.001). The data provide support for the reliability and validity of the RCSQ (13). It has widely been used in clinical studies for sleep quality assessment (14-19). Although this questionnaire has been translated into most popular languages for quality assessment of sleep in patients, there is a great gap for localization and translation of this questionnaire into the Farsi, the Iranian language. Considering the existing gap and the need for such a suitable instrument for quality assessment of sleep in patients in intensive care units (ICU), the aim of the present study was to examine the psychometric properties of Richard Campbell sleep questionnaire in patients in the intensive care unit. This methodological study was conducted in Baqiyatallah University of Medical Sciences in Tehran. The study population consisted of all patients admitted to cardiac surgery intensive care unit (CICU) of Baqiyatallah Hospital in Tehran in 2016. Selection criteria included an age of 15 or more, hospitalization in CSICU for 2 days or more, complete consciousness, no use of psychiatric medications, no use of hypnotics or opioids 5 to 6 hours before nighttime sleep, no affliction by class III or IV heart failure, known sleep disorders, and hearing or visual problems. Exclusion criteria were reluctance to stay in the study, need for cardiopulmonary resuscitation, and the intake of sedatives, hypnotics, anesthetics, or amphetamines during the study. Sample size was calculated using Altman’s nomogram and the results of a similar study the nomograpm showed that with a type I error of 0.05 and a power of 0.80, 45 patients were needed ninety in total. However, considering an attrition rate of 10%, we increased sample size to 100 (14). Samples were selected according to the inclusion criteria using non-probability sampling method. Study instruments were a demographic questionnaire and Richards-Campbell sleep questionnaire (RCSQ). RCSQ is a self-administered questionnaire, as a brief scale, RCSQ contains 5 items on perceived sleep depth, sleep onset latency (or time to fall asleep), number of awakenings, efficiency (or percentage of time awake), and sleep quality as well as one item on perceived nighttime noise. The 1st 5 items are responded using a 100-millimeter visual analogue scale. The mean of all 5-item scores ranges from 0 to 100 and shows total sleep quality. Higher scores represent higher sleep quality. The 6th item is also scored from 0 (very noisy) to 100 (very quiet) (13). The psychometric properties of Richard Campbell sleep questionnaire (RCSQ) were evaluated in 2 stages. The 1st step involved the process of standard translation of the questionnaire, evaluation of face and content validity, and reliability (internal consistency and stability) of its translated version. The translation process was performed according to the quality assessment of life style provided by WHO as a forward and back translation. The 5-item questionnaire was selected based on the research objectives and the criteria considered by the researcher. For translating the questionnaire, a written consent form was obtained from designer of the questionnaire, Richard Campbell. In the 1st step, the questionnaire was translated from its original language into Farsi, the Iranian language, by 2 native translators. In the 2nd step, the initial translations were reviewed and compared by another translator who was mastered both source and target languages. Then, differences and contradictions between the translations were determined and corrected. Finally, the translations were combined and integrated and the final Iranian version of the questionnaire was prepared. In the 3rd step, the Iranian version of the questionnaire was translated back into English. 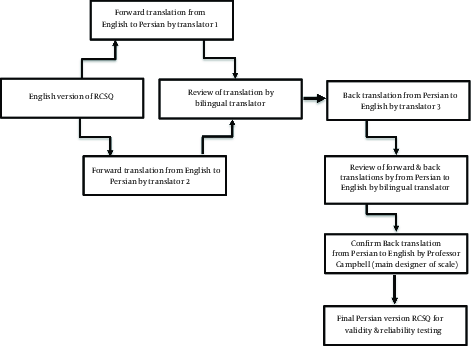 In the 4th step, the translated version of the questionnaire (from Farsi into English) was reviewed and sent to Richard Campbell to be confirmed. Then, the Iranian translation was reviewed by the experts in terms of spelling mistakes and grammatical errors, and its final version was provided to evaluate the psychometric properties (Figure 1). To determine face validity of the questionnaire, the following items were evaluated. - Difficulty level: Identifying items, phrases or words that are difficult to understand. - Appropriateness: Accuracy and appropriateness of the desired relationship between questionnaire objectives and components. - Uncertainty: Defining ambiguous and unclear words that make different interpretations (20). By changing the sentences and phrases for face validity, the whole validity may change; therefore, after designing the questionnaire, face validity should be evaluated as the first measure (21). In this study, content validity was evaluated qualitatively. For this purpose, a number of experts were interviewed and asked to read the questionnaire carefully and provide their corrective views comprehensively in a written form. In this method, some points such as observing grammar, using proper words, placing items in their proper place, and appropriate scoring were investigated by the experts. To evaluate the reliability of questionnaire, in this study, 100 patients who met the inclusion criteria were selected using the convenience sampling method. On the 2nd and 3rd day after the hospitalization, quality of their past night’s sleep was measured using the questionnaire. The collected data were analyzed using the SPSS software (v. 21). Internal consistency and inter-rater reliability through computation of the Pearson correlation was used. To determine internal consistency, the Cronbach’s alpha coefficient was calculated (Table 1). According to this method, the questionnaire will be reliable if the Cronbach’s alpha coefficient be greater than or equal to 0.7 (22). Another method used for assessing the reliability of the questionnaire was inter-rater reliability that measures stability coefficient and correlation coefficient between different observers, evaluators and referees of a subject, which is also called the coefficient of agreement and is shown by the Kappa coefficient (23) (Table 1). In this study, the mean age of participants was 60.65 years with standard deviation of 10.035. Also, 72% of the participants were male and 28% were female. The face and content validity of the questionnaire were qualitatively at desired level. Reliability of the questionnaire was measured using inter-rater reliability through Pearson correlation coefficient (r = 0.714, P < 0.0001) and internal consistency through Cronbach alpha (r = 0.906, P = 0.0001). The findings of this study showed that Richard Campbell sleep questionnaire (RCSQ) is a useful instrument for measuring the sleep quality in patients in the intensive care units (ICU). The psychometric properties of the questionnaire have been confirmed in several studies and its validity, for the 1st time, was measured in Iran. According to the findings of this study, this questionnaire had a desirable validity and reliability for measuring the sleep quality in patients in the intensive care unit (ICU), which is consistent with the results of other studies (14-16). Li-Xia et al., (2016) evaluated validity of the Chinese version of this questionnaire in China, and reported the content validity of 0.84, internal consistency reliability of 0.874 and test-retest reliability of 0.912 (24). In a study by Krotsetis et al., (2017) in Germany, the German version of the Richard Campbell sleep questionnaire showed internal consistency (Cronbach’s alpha) of 0.88, and mean standard deviation (SD ± 27.57) of 47.00 (19). Also, in a study by Hu et al., (2015), the Chinese version of the RCSQ, showed internal consistency (Cronbach’s alpha) of 0.84 (25). Another study by Missildine et al., (2010) showed internal consistency (Cronbach’s alpha) of 0.90 and validity of 58% (18). According to the study by Frisk et al., (2003), RCSQ is a reliable and valid instrument to measure the sleep quality of patients in the intensive care unit (12). Also, several studies have confirmed the validity and reliability of RCSQ (14, 16, 17). Advantages of the questionnaire include a few simple and understandable questions for critically ill patients, having a visual state, a special design to measure the quality of sleep in patients admitted to intensive care units, as well as its high validity and reliability. Therefore, this questionnaire is recommended to measure the quality of sleep in patients in intensive care units. One of the limitations of this study is that this study was only performed in patients admitted to the intensive care unit in Tehran. Further studies are recommended to be performed on other groups of patients and hospitalization units, even in a comparative way. Richard Campbell sleep questionnaire is a short and easy instrument that has been developed with acceptable psychometric properties. According to the results of this study, the psychometric properties of this study in Iran are consistent with those of studies in different countries with different culture. Given the special condition of patients in the intensive care unit and the inadequacy of their mental and physical condition, It was also revealed that this questionnaire is a suitable instrument in terms of simple scoring, desired reliability and validity for measuring the quality of sleep in patients, and can be used by health care providers such as nurses to measure the quality of sleep in patients admitted to the intensive care unit. This study was funded by the Baqiyatallah University of Medical Sciences in Tehran. The authors would like to thank the entire staff of Baqiyatallah hospital of Tehran and those who participated in this study for their cooperation. In addition, a special thanks to Prof. Richard Campbell who was in charge of correspondence and allowed the questionnaire to be translated into Farsi and subjected to psychometrics. Authors’ Contribution: Ahmadali Amirifar: searching, data gathering, and writing the manuscript; Masoud Siratinir: data analysis., Abulfazl Rahimi and Fakhrudin Faizi: study design, data gathering, and writing the manuscript. 1. Kamdar BB, Needham DM, Collop NA. Sleep deprivation in critical illness: its role in physical and psychological recovery. J Intensive Care Med. 2012;27(2):97-111. doi: 10.1177/0885066610394322. [PubMed: 21220271]. 2. Hamilton NA, Affleck G, Tennen H, Karlson C, Luxton D, Preacher KJ, et al. Fibromyalgia: the role of sleep in affect and in negative event reactivity and recovery. Health Psychol. 2008;27(4):490-7. doi: 10.1037/0278-6133.27.4.490. [PubMed: 18643007]. 3. Pisani MA, Friese RS, Gehlbach BK, Schwab RJ, Weinhouse GL, Jones SF. Sleep in the intensive care unit. Am J Respir Crit Care Med. 2015;191(7):731-8. doi: 10.1164/rccm.201411-2099CI. [PubMed: 25594808]. 4. Elliott R, McKinley S, Cistulli P. The quality and duration of sleep in the intensive care setting: an integrative review. Int J Nurs Stud. 2011;48(3):384-400. doi: 10.1016/j.ijnurstu.2010.11.006. [PubMed: 21185560]. 5. Greve H, Pedersen PU. Improving sleep after open heart surgery-Effectiveness of nursing interventions. J Nurs Educ Pract. 2016;6(3):15-22. 6. Warren A, Soulsby C, Quasim T, Kinsella J, McPeake J. 299: Intensive Care unit length of stay is associated with insomnia in critical Illness Survivors. Crit Care Med. 2015;43(12):76. doi: 10.1097/01.ccm.0000474127.78517.54. 7. Chamanzari H, Moghadam MH, Malekzadeh J, Taghi M, Shakeri SKH, Hosseini SM. Effects of a quiet time protocol on the sleep quality of patients admitted in the intensive care unit. Med Surg Nurs J. 2016;3(13):16-7. 8. Orwelius L, Nordlund A, Nordlund P, Edell-Gustafsson U, Sjoberg F. Prevalence of sleep disturbances and long-term reduced health-related quality of life after critical care: a prospective multicenter cohort study. Crit Care. 2008;12(4):R97. doi: 10.1186/cc6973. [PubMed: 18673569]. 9. Hoey LM, Fulbrook P, Douglas JA. Sleep assessment of hospitalised patients: a literature review. Int J Nurs Stud. 2014;51(9):1281-8. doi: 10.1016/j.ijnurstu.2014.02.001. [PubMed: 24636444]. 10. Senthilvel E, Auckley D, Dasarathy J. Evaluation of sleep disorders in the primary care setting: history taking compared to questionnaires. J Clin Sleep Med. 2011;7(1):41-8. [PubMed: 21344054]. 11. Boyko Y, Ording H, Jennum P. Sleep disturbances in critically ill patients in ICU: how much do we know? Acta Anaesthesiol Scand. 2012;56(8):950-8. doi: 10.1111/j.1399-6576.2012.02672.x. [PubMed: 22404330]. 12. Frisk U, Nordstrom G. Patients' sleep in an intensive care unit--patients' and nurses' perception. Intensive Crit Care Nurs. 2003;19(6):342-9. doi: 10.1016/S0964-3397(03)00076-4. [PubMed: 14637294]. 13. Richards KC, O'Sullivan PS, Phillips RL. Measurement of sleep in critically ill patients. J Nurs Meas. 2000;8(2):131-44. [PubMed: 11227580]. 14. Kamdar BB, Yang J, King LM, Neufeld KJ, Bienvenu OJ, Rowden AM, et al. Developing, implementing, and evaluating a multifaceted quality improvement intervention to promote sleep in an ICU. Am J Med Qual. 2014;29(6):546-54. doi: 10.1177/1062860613509684. [PubMed: 24270169]. 15. Kamdar BB, Shah PA, King LM, Kho ME, Zhou X, Colantuoni E, et al. Patient-nurse interrater reliability and agreement of the Richards-Campbell sleep questionnaire. Am J Crit Care. 2012;21(4):261-9. doi: 10.4037/ajcc2012111. [PubMed: 22751369]. 16. Bourne RS, Minelli C, Mills GH, Kandler R. Clinical review: Sleep measurement in critical care patients: research and clinical implications. Crit Care. 2007;11(4):226. doi: 10.1186/cc5966. [PubMed: 17764582]. 17. Nicolas A, Aizpitarte E, Iruarrizaga A, Vazquez M, Margall A, Asiain C. Perception of night-time sleep by surgical patients in an intensive care unit. Nurs Crit Care. 2008;13(1):25-33. doi: 10.1111/j.1478-5153.2007.00255.x. [PubMed: 18226052]. 18. Missildine K, Bergstrom N, Meininger J, Richards K, Foreman MD. Sleep in hospitalized elders: a pilot study. Geriatr Nurs. 2010;31(4):263-71. doi: 10.1016/j.gerinurse.2010.02.013. [PubMed: 20682404]. 19. Krotsetis S, Richards KC, Behncke A, Kopke S. The reliability of the German version of the Richards Campbell Sleep Questionnaire. Nurs Crit Care. 2017;22(4):247-52. doi: 10.1111/nicc.12275. [PubMed: 28168810]. 20. Taghizadeh Z, Ebadi A, Montazeri A, Shahvari Z, Tavousi M, Bagherzadeh R. Psychometric Properties of health related measures. Part 1: transliation, development, and content and face Validity. J Iran Inst for Health Sci Res. 2017;3(343-57). 21. Broder HL, McGrath C, Cisneros GJ. Questionnaire development: face validity and item impact testing of the Child Oral Health Impact Profile. Community Dent Oral Epidemiol. 2007;35 Suppl 1:8-19. doi: 10.1111/j.1600-0528.2007.00401.x. [PubMed: 17615046]. 22. Santos JRA. Cronbach's alpha: A tool for assessing the reliability of scales. J Ext. 1999;37(2):1-5. 23. Hallgren KA. Computing Inter-Rater Reliability for Observational Data: An Overview and Tutorial. Tutor Quant Methods Psychol. 2012;8(1):23-34. [PubMed: 22833776]. 24. Li-Xia C, Dai-Hong JI, Qiao-Yu Z, Zhen-Ling W, Liang W, Yan L. The reliability and validity of the chinese version of richards-campbell sleep questionnaire. Chin J Nurs. 2016;51(9):1141-4. 25. Hu RF, Jiang XY, Hegadoren KM, Zhang YH. Effects of earplugs and eye masks combined with relaxing music on sleep, melatonin and cortisol levels in ICU patients: a randomized controlled trial. Crit Care. 2015;19:115. doi: 10.1186/s13054-015-0855-3. [PubMed: 25881268].